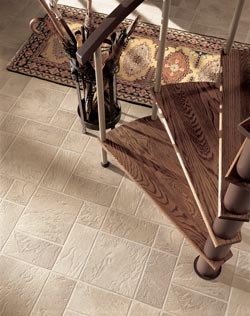 One of the most versatile surfaces you can choose for your home is vinyl flooring in Winchester, VA. Step into Flooring America to explore a multitude of options in this most attractive and durable option. Our flooring showroom is the place to shop for selection and service. When you want it all in your flooring, come to us for vinyl. This surface provides you with great variety in brand, color, and appearance. Here are some examples: Perhaps you love tile, but are seeking an option that is lower in maintenance and in price. We’ll show you vinyl tile that so closely resembles the real thing you’ll have a hard time telling the difference. Or, maybe, you’ve always wanted hardwood plank in your home. Our professionals bring you samples of vinyl plank that has the natural appearance of wood. The price tag is smaller than other choices, and it only requires minimal care to look stunning always. Vinyl is also available in sheets with a wide array of looks. These big sheets cover a whole lot of territory by mimicking porcelain, slate, or ceramic tile, or appearing like domestic and exotic hardwood species. In addition, there are pretty patterns and fanciful designs to improve the aesthetic of your space. Our high-performance vinyl flooring works well in any room of your house. Since it resists moisture, it often is found in the bathroom, kitchen, or basement. However, don’t limit this surface to these spaces for its appeal and durability make it equally welcome in your grand foyer, formal dining room, and master bedroom suite. When you’ve picked out your favorite in vinyl flooring, let us boost the beauty and longevity with installation by skilled professionals. Ask us to schedule a convenient day and time for installation specialists to come to your home. They bring the product, tools, and expertise to install this flooring properly. In our experience, proper installation means the difference between mediocre and optimal appearance and performance. Contact us today to assist you in finding vinyl flooring that complements your décor and stands up to heavy foot traffic. We proudly serve customers from Winchester, Strasburg, Stephens City, and Middletown, Virginia, and Martinsburg, West Virginia, as well as the surrounding areas.